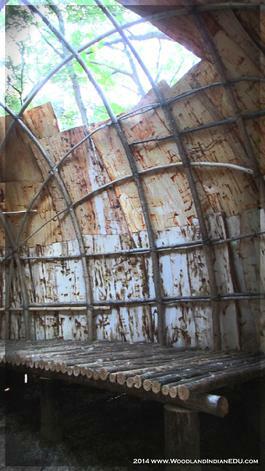 Of all traditional Native-style structures built in the Eastern Woodlands, it is the dome-roofed wigwam that many museums and parks find tricky to replicate. Often the thought of bending poles leads first time builders to use saplings far too thin for the job. Space these small weak poles too far apart, and they can hardly support even a couple pieces of heavy bark, let alone a snow load or a builder climbing on the structure. 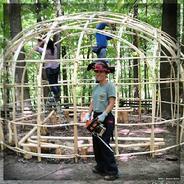 Use the correct thickness of sapling and first time builders often find their wigwam to come out more pointed than round, as seasoned builders understand how to get the round shape through the right ground level angling, pre-bending, and the correct pulling/pushing pressure in the right directions. Cut saplings too short (because just a couple feet of overlap is not enough) and the shape of the structure suffers. And often folks who fail to put fresh bark sheets on their wigwams without adequate bracing results in much rolling of the “shingles” leading to unusable coverings. We have seen these headaches, and they are real… Many staff/volunteer hours given to a Native home exhibit project that in the end just didn’t pan out. Underestimating the building prowess of historic Native Peoples and the skills and know-how needed in creating dome wigwams can often result in a time-consuming and material-wasting mistake. These well-built permanent homes, meant to last for a few or more years (with usual repairs) were not “huts” or simple shelters, nor are they easily replicated with diagrams and step-by-step instructions from internet hobby sites or woods lore publications. Every wigwam is different. There is no set number of poles used, or set guidelines on pole placement (outside of the basic “vertebrae” and “ribs” pattern) – poles must be placed where they are needed, something that can only be learned by doing. Even horizontal pole spacing is based only partly on the size of the structure as the coverings dictate the placement too (especially when it comes to bark sheets). This is something a neatly packaged “how-to” guide cannot teach. It is highly recommended that a site wanting to save time, materials, and create a respectable reflection of traditional Native-style architecture should seek to have an experienced wigwam builder head your project, whether you choose Jessica of WIEP’s wigwam building workshop or another experienced builder of traditional Native-style structures. This is why we offer this workshop. 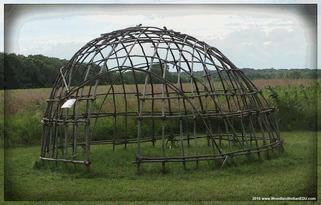 Covering wigwam frame with elm, ash, and maple bark. And keep in mind, our Wigwam Building Workshop is not all about the process of building in a traditional way, though we talk much to this topic. This is not a class in “ancient skills” or experimental archaeology. 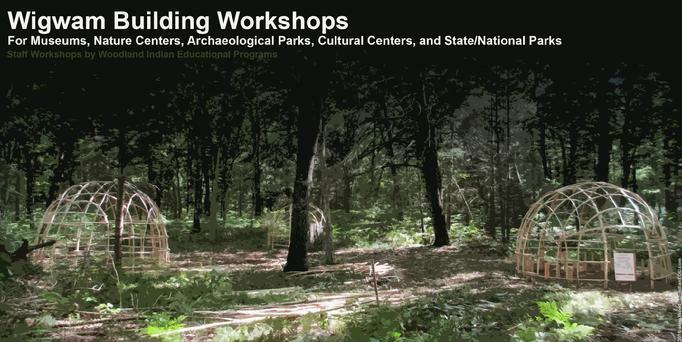 This is a workshop intended for museum/park/nature center professionals to learn how to replicate a life size wigwam for exhibit use in a practical way. We use modern tools and some conventional tricks. Our wigwams are made to be exhibits for the public or classrooms for traditional learning in a modern world. We have much experience in accommodating the needs of the site’s patrons when designing/creating wigwams (such as using floating platforms or overbuilding platform structures to take the wear and tear of thousands of fieldtrip children, or widening doorways to accommodate wheelchairs). The end goal of these workshops is twofold: to have a working wigwam example at the end of the workshop, and to have a group of site staff/volunteers who know the basics of wigwam building, who can then go forth and replicate the process themselves and care for their site’s structure(s) as needed. How long is a Wigwam Building Workshop? WIEP wigwam frame almost 6 years old. Public wigwam building program conducted for a powwow (note: this program is different from the staff workshop and has different pricing and requirements). - Price: $160 per day (plus mileage and hotel fare… to be determined based on location of build). - At least 5 volunteers/staff members are needed every day. - We furnish tools* and conventional construction materials, though we encourage wigwam workers to bring personal tools like work knives, hatchets, and gloves. *Two exceptions: 1. A large chainsaw to cut down mature trees, along with a seasoned chainsaw operator, comfortable with felling trees as large as 18” in diameter. This person is needed only for days harvesting trees for bark – Jessica operates a small chainsaw for cutting saplings, but welcomes other chainsaw operators to help in this task, as it can save time and even money (cutting fees). 2. Possibly an all-terrain vehicle, like a Gator, to retrieve bark sheets if source is at any distance from build site. Note: Wigwam building is a seasonal job - mid May to late June is the optimal time to conduct the workshop (depending on location). This is the time of year the bark separates from the sapwood and peels in usable large sheets, and when saplings of many species will bend more freely without snapping. With this in mind, most schedule a year or two in advance. 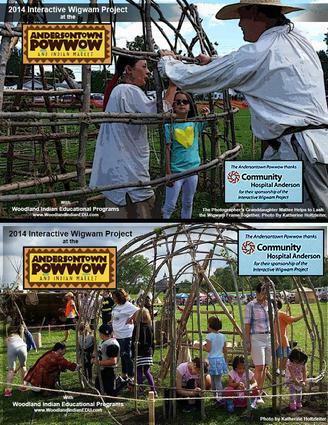 We often conduct only a single wigwam workshop a year. We understand that the sites we work with are mostly non-profit and need to keep expenses to a minimum. We can work with you to try to save money, such as having your staff/volunteers harvest saplings the day before the start of a build, or having a site supply a staff/volunteer chainsaw crew of 2 or 3 ready to quickly harvest poles and bark to keep work hours down. However, please know we are very experienced and the estimated timelines given per workshop are based on your site and what will be the necessary time to complete the project (given no major disruptions, like long spells of bad weather). We understand sites want to negotiate for shorter timelines, but it is not in their best interest to do so. Time is based on 8-hour work days, with a half hour lunch break, working at a sustainable pace with 5 or more staff/volunteers. Less time will result usually in an uncompleted wigwam. With that said, should the project be completed sooner than the projected timeline, as for example a day ahead of schedule, we will cut the price of that day off the fee. We don’t charge for extra days not needed even though the fee was already agreed to. We know every penny counts for organizations that serve their communities with education and fellowship, and we share in the satisfaction of saving sites funds that can be allocated to other worthwhile missions. *Jessica has the right to turn down any potential workshop for personal or professional reasons, including but not limited to: A site’s inadequacy in serving a general public or Native community in an educational manner (such as non-Native clubs, member only camps, etc. ); A site’s claim to representing a specific Tribe/Nation as members of such with no official standing in said Native community; A site’s noncompliance to represent Native Peoples/cultures/history in a respectful manner; And so on. Jessica heads the building of traditionally residential or communal structures for interpretive use and educational exhibits only… she does not build sacred spaces/structures for religious use, specifically sweat lodges and medicine lodges, so please refrain from asking. Thank you.